Cilantro is a delicious herb that adds a burst of flavor to just about any dish. Not only does it taste good, but it is also good for you! The stems should be removed before use and the leaves chopped to desired size for pureeing for sauces, sautéing with meat or vegetable dishes, or adding whole to soups and dips for a burst of fresh flavor. To maintain optimum flavor, cilantro should be added toward the end of cooking when possible. Cilantro makes a great addition to salads, dressings, sandwiches, soups and tacos. 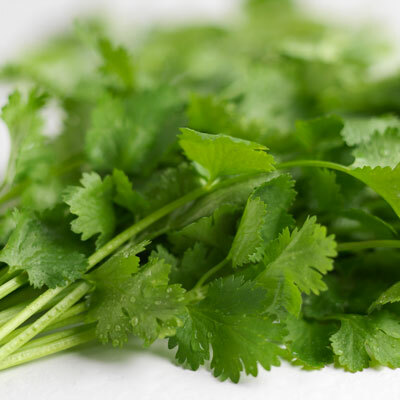 When selecting cilantro, choose some with a vivacious green color and firm body. It should also be aromatic. Be sure to avoid cilantro that is wilted or turning black. After rinsing with water, cilantro should be wrapped in a paper towel and placed in a plastic bag or container. Always wash fresh produce before consuming.